Los Angeles -- The Los Angeles Dodgers and the rest of Major League Baseball celebrated Jackie Robinson Day Monday. This year was special for the annual event, since it marked what would have been the baseball legend's 100th birthday, noted CBS Los Angeles. 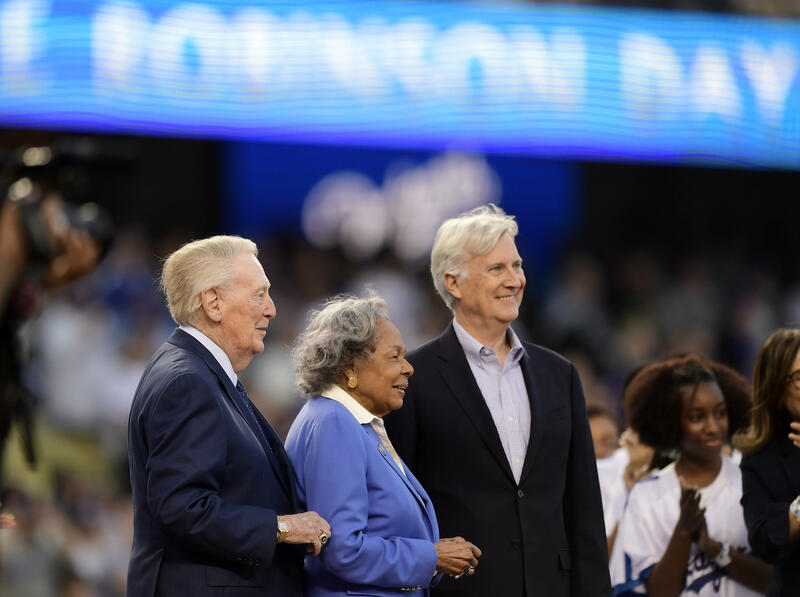 Iconic Dodgers announcer Vin Scully joined Robinson's widow at Dodger Stadium Monday night to honor the player who broke baseball's color barrier. Scully greeted 96-year-old Rachel Robinson with a kiss after being introduced to the crowd, with Scully drawing the loudest cheers in a rare public appearance. The Dodgers beat the Cincinnati Reds 4-3 in the game that followed the ceremony. Scully stood behind Rachel with his hands holding her arms during the national anthem. They were joined by Robinson's daughter, Sharon, and son, David, who linked arms with their mother as they walked on the field. Only 7.7 percent of current MLB players are black, according to MLB. "To this day, I still read about him," Black said in San Diego. "What a pioneer. What a great example of a human being and what he meant to our country, and in the bigger picture, what he meant for all of us culturally, not only in baseball, but in society." In Minnesota, Toronto Blue Jays manager Charlie Montoyo started his pregame media session at 3:42 p.m. CDT in honor of Robinson. "That's probably one of the people in baseball I wish I would've met," he said. The Dodger Stadium pregame ceremony included 42 current and former Jackie Robinson Foundation scholars. Students from Cleveland Elementary, Washington Middle School and John Muir High - all attended by Robinson while growing up in nearby Pasadena - were on hand. Missing from this year's L.A. ceremonies was Don Newcombe, the third black pitcher in the major leagues when he was with the Brooklyn and later Los Angeles Dodgers. He and Robinson were among the first four black players named to an All-Star team. Newcombe died in February at age 92. As CBS Sports' Kevin Skyver and Matt Snyder noted, many big leaguers took to social media to pay tribute to -- and thank Robinson.